Um, yum. Right? All the deliciousness of a s'more without the graham cracker breakage that causes marshmallow and chocolate to drip down your chin. 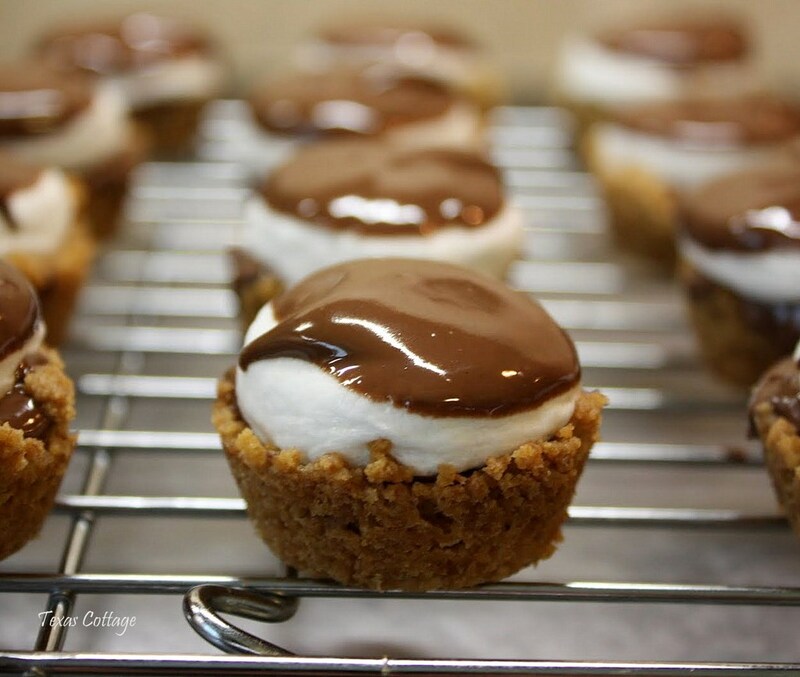 And if you're like us and went camping this weekend but didn't actually get a s'more because you had to choose between s'mores and putting your baby to bed, you probably have all the supplies and all the unfulfilled cravings you need to whip these babies up. Speaking of that trip, rare is the latrine that makes me wish I was using a bush. This outhouse even had two direct portals to h#ll "toilets" in one little room. I assume it was so you could bring a friend and hold hands to make sure nothing tried to kill you while you were in there. Delightful conversation right before sharing a recipe, eh? Begin by crushing one cup of graham crackers. This part was easy, all I had to do was dump the contents of Logan's carseat into a bag. If you don't have a carseat like mine you should smash 7 whole crackers for a cup's worth. Toss your crumbs into a bowl, then add 1/4 c. powdered sugar, and 6 Tbs melted butter. Then press 1 Tbs of mixture into a mini muffin pan. For the first batch I used my fingers to press. On the second batch I used the back of the tablespoon. It was a duh moment. I also sprayed the pan first although I'm not sure if I needed to. Bake in a 350 degree oven for 4-5 minutes or until edges bubble. My edges didn't actually ever bubble, presumably because when I was microwaving the butter at least a tablespoon of it splattered all over the inside of my microwave. So I may have not had enough butter to bubble. Another reason for the Pam. Take the pan from the oven and add some chocolate chips, or a piece of chocolate bar to the bottom of the cups. I never understood why my mom ate plain chocolate chips when I was a kid. I always thought there were so many better candy options out there. Now I love them. Especially the fancy brands. Plus they are perfect to sneak while Logan and I are playing a game of "hide and go scare" where he closes me in the pantry and runs away and I, after an indeterminate amount of time (about as long as it takes me to destroy the evidence of a handful of chocolate chips) run out and grab him. The thrill of the steal tastes almost as good as the chocolate itself. Hmm. The apple really doesn't fall far from the tree. ANYway, after you load the cups up with chocolate, cut the marshmallows in half and put one half of a marshmallow, cut side down in each cup, then put them back in the oven so the mallows can soften. DON'T BE LIKE ME. Remember, the pan is still hot from being in the oven. Use oven mitts. And if you're feeling brave turn on the broiler for a little extra crisp. But try not to overdo it. Keep in mind it's hard to see smoke with the door closed even if the oven light is on. But guess what! After dipping them in chocolate, the great equalizer, they all look delicious. And the truth is I liked the overcooked ones better. They had more of a roasted marshmallow flavor. By the way, the recipe said to melt your chocolate bar/chips and dip the tops of the marshmallows in that. I had some extra almond bark left over from another treat so I melted that down and used it. The skinny: These were the perfect treat. The recipe makes about 24 but it could easily be cut down or multiplied for as many as you want. They were also so easy to make. As you can see, they actually turned out almost exactly like the original picture which is a rare achievement for me. If you like s'mores (and you know you do) you have got to make these. Woo hoo, Jess has done it again. She made a pico de gallo that I assume looked like this :) Hooray for pinterest! And another! My friend Jillian made taco bowls and showcased them over at What's in Your Oven. Don't her kids look so cute and excited to eat them? I'm gonna have to try these too. hey! i keep forgetting to write and tell you that you have inspired me to tackle some pinterest things. so far i've made a green smoothie, made dinner with a recipe from pinterest, went shopping for something that turned out to be not-so-great, and made little abc frame things for my kids' rooms. all because of you! :) i am loving your posts, as usual. "Rare is the latrine that makes me wish I was using a bush." Ha. That cracked me up. I love your posts. LOVE LOVE LOVE!!!!!! :) Now I found you!! I am going to do this whole 1 a day thing too! These look absolutely fabulous! Why am I not on Pinterest yet? ?